This card is available to Supervisors and Managers with on the job experience (normally at least one year in the last three), but do not hold an NVQ or SVQ level 3, 4 or 5 and are not a member of an approved Professional Body. To apply/renew this RED CSCS CARD, please click here. If you need further information, please Contact Us. The card is valid for three years and is non-renewable. The card is issued on a temporary basis, while a NVQ or SVQ is being achieved. It is expected to be replaced by a skilled five year card on achievement of NVQ or SVQ Level 3 or higher. This card is available to everyone with on the job experience (normally at least one year in the last three). Please Contact us if you need more information on CSCS card or occupations. The card is valid for one year and is non-renewable. The card is issued on a temporary basis, while a NVQ or SVQ is being achieved. It is expected to be replaced by a skilled five year card on achievement of NVQ or SVQ Level 3 or higher. An Experienced Worker Card cannot be replaced by a Construction Site Operative or a Basic Skills Green Card. 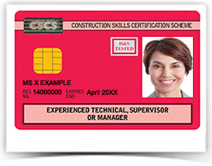 To apply/renew this RED CSCS CARD, Click here.